When I can’t get to Chinatown in Boston or New York, I cook my version of a recipe I discovered many years ago in “The Chinese Cookbook,” a wonderful source of information by former NY Times food critic Craig Claiborne and Virginia Lee. I prefer using a whole pasture-raised organic chicken from my good friends at Fire Fly Farms in Stonington, CT (www.fireflyfarmsllc.com). Remove all giblets from chicken. Rub the soy sauce all over the chicken. Then rub the peanut oil all over the chicken. Combine Chinese Five Spice, garlic powder, salt and pepper in a bowl. Season entire chicken, including inside the cavity, with this mixture. Pre-heat oven to 300 degrees. Place chicken in a pan lined with aluminum foil (cleanup will be easier) and bake. Meanwhile, combine hoisin sauce and sesame oil in a small bowl. 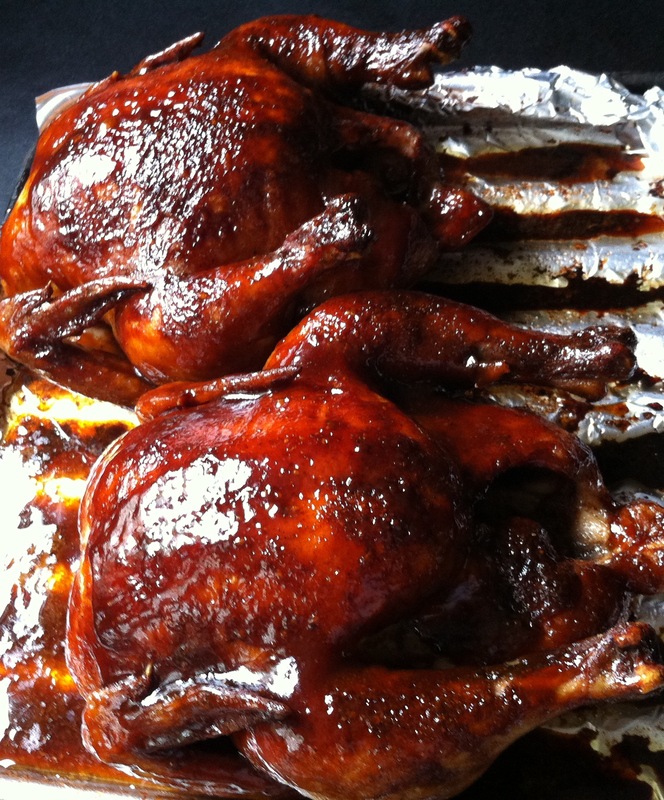 When chicken is about 15 minutes away from being done, brush with hoisin/sesame oil mixture. Cook another 15 minutes until chicken has a nice dark glaze…do not burn! Let rest about 15 minutes before carving. VELVET ELVIS: 2 INGREDIENTS. 1 DELICIOUS COCKTAIL.